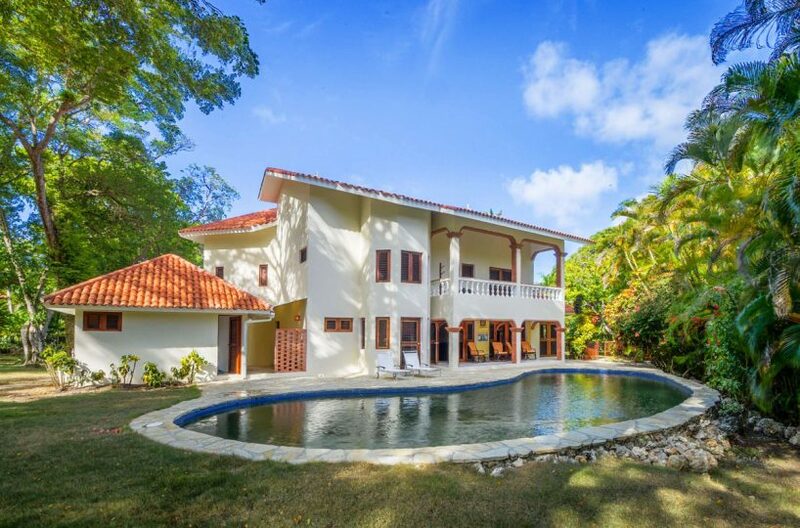 Casa Las Breezes is a spacious five bedroom villa which is impeccably maintained, and thoughtfully decorated with guests comfort in mind. Three bedrooms are located on the second floor, and two large suites are on the ground floor. The main living and dining areas have vaulted ceilings and abundant natural light. The kitchen is well-equipped and perfect for the home chef. A large swimming pool and a covered gazebo are prominent features of the spacious lawn which is surrounded by palm trees and tropical plantings. Enjoy the ocean breezes from the walkways, or spend all your time in Sea Horse Ranch’s most complete gazebo where you can do everything from reading to listening to music to entertaining by the open air bar. This is why you came on vacation! To enjoy an al-fresco nap by the pool, listening to the gentle rustle of palm trees while soaking up the Caribbean air. The large eat-in kitchen is yet another great area to hang out. Last but not least, the pool is a long rectangular shape, which is perfect for lap swimming. At night, perhaps the Jacuzzi? Contact us for a viewing of this magnificent property today.